Very little is known of this church’s history. The building was constructed as the Brunswick Evangelical & Reformed Church in 1910, and served as such until December of 1968. Today, the red brick structure has retained most of its original appearance and the original stained glass windows. Many years after the church closed its doors as a house of worship, the building once again came to life as Beans in the Belfry Meeting Place & Café. Couples who got married in this church or worshipped here as kids, now enjoy fellowship, good food and entertainment on a regular basis and on the many special events in downtown Brunswick, such as Railroad Days, Hometown Holidays and progressive dinners organized by the City or the Brunswick Main Street organization for the revitalization of downtown.. 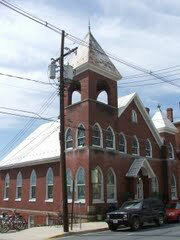 It continues to stand and is again a lively part of Brunswick’s downtown historic district.